We push the i7-7700K, i5-7600K, and i3-7350K to their limits. Kaby Lake. (That's 'Kaby rhymes with baby' if you're wondering, according to my press contact over at Intel, though I've heard it called 'Cabbie' Lake by more than a few folks.) Intel's 7th Generation Core processors are now available for everything from 2-in-1 devices to laptops to full blown desktops. And what do you get with the new generation of parts? My Kaby Lake overview covers that, but the main story for desktop users is that Kaby Lake increases the clock speeds and clock speed range of Skylake. This is thanks to refinements in Intel's 14nm manufacturing process, and if you're wondering how much junk is left in the trunk, that's what I'm here to explore. Intel has had unlocked 'enthusiast' processors for a while now, but users interested in a budget-friendly option have generally been left out. The Pentium G3258 Anniversary Edition is the one exception, a chip that could overclock well but which was hobbled by a pure dual-core configuration and limited L3 cache. Intel is trying something new with Kaby Lake, bringing out a Core i3 K-series part that supports overclocking. The only problem: it's priced too high to really qualify as a budget option. The Core i3-7350K costs $168 (for 1000 units, so it'll be a bit more at retail initially), compared to the i5-7600K ($242) and i7-7700K ($339). There are other potential options as well, which I'll return to in a minute. Before we get any deeper, anyone new to overclocking needs to understand a few things. First, overclocking results are never 'guaranteed,' so even if everyone and their dog is able to run at 5.0GHz, you might get a dud chip that tops out at 4.8GHz. Trust me on this: it happens, and it's not the end of the world. That goes double now that we're looking at overclocks that amount to around two percent more performance for every 100MHz. Second, if you screw up your chip via overclocking (which is pretty unlikely these days, unless you shove too much voltage down its throat), it's on you—the default warranty doesn't cover overclocking (though you can purchase a protection plan if you want to). Or you can buy a boutique PC that comes factory overclocked. The third point is where things start to get a bit nebulous. Overclocking depends on many factors, including your particular chip, but also your motherboard, CPU cooling, and even less obvious factors like memory and power supply. Basically, don't skimp on most areas and you should be fine. I'm not doing anything exotic here, so if you want to see results with liquid nitrogen (LN2), sorry. Instead, I'm looking at the sort of overclocks most people will go after with a good closed-loop cooler. Let's talk about the test platforms a bit. 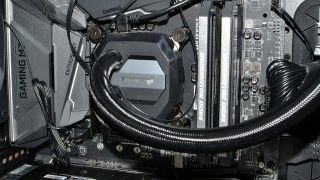 I have Corsair's 280mm Hydro 115i closed-loop liquid cooler for the CPU, which should provide ample cooling for most users. For overclocking, I erred on the side of aggressive cooling and set Corsair's Link software to 'Performance' mode rather than 'Balanced' or 'Quiet.' However, I do have to note that the current version of Link doesn't detect Kaby Lake processors—it doesn't show or monitor CPU temperatures, so I had to set fan speed manually. On the motherboard front, I'm using MSI's Z270 Gaming M7 for the KBL parts. This is a board that sits near the top of MSI's 'mainstream' Z270 line, with their 'Godlike' line of motherboards designed for those who want to take things to the next level (LN2), but pricing makes those an extremely niche product. The M7 features RGB lighting, auto-overclocking support that can try for up to 5.2GHz if you crank the dial to 11 (no, it didn't work for me), and a nice collection of other features like triple M.2 slots. I've done limited testing with a few other motherboards, including MSI's Z270 Gaming Pro Carbon and Z270 Tomahawk, and overclocking results were similar. The same goes for testing with Asus's Strix Z270G Gaming. There are some practical differences in features and even performance, due to differences in the BIOS/firmware, but so far overclocking hasn't shown any major gaps between modest parts like the Tomahawk and higher end offerings like the Gaming M7. For Skylake comparisons, I've used two different motherboards. First is my standard testbed for Skylake, with Asus's mainstream Z170-A motherboard. The second board is ASRock's Z170 Gaming K6, which supports BCLCK overclocking of non-K processors. This feature was present, then disabled at one point, but now it's back. That makes Intel's i5-6400 and i5-6500 potential options for overclocking as well, if you're willing to go with the ASRock board. Incidentally, word on the street is that Intel isn't very happy with ASRock and others for providing this functionality, and some boards that once had non-K overclocking ended up disabling the feature. I definitely wouldn't count on Z270 boards to support non-K overclocking, but I guess we'll have to wait and see. Anyway, the ASRock Gaming K6 using the latest P7.20 BIOS still works with an i5-6400, a $185 true quad-core part, meaning an extra $15 compared to the i3-7350K. That adds a third Skylake comparison point to the overclocking charts. There was a time when overclocking required a certain amount of finesse and skill. These days, you can get 98 percent of the maximum performance with very little thought or effort. Adding faster RAM and manually tweaking timings might be interesting for a small subset of users, but most enthusiasts are content to adjust the CPU multiplier, resulting in 100MHz steps (or 50MHz on some AMD CPUs). This is the approach I took here, tuning the multiplier and voltage and running some stress tests to find a stable result. Here's the high-level overview, with some additional notes below. The Skylake chips are pretty straightforward. Both the i7-6700K and i5-6600K managed to run stable at 4.7GHz. 4.8GHz was almost stable, but a few tests would occasionally lock up, even with additional voltage. The i5-6400 is a different beast, where you can't adjust multiplier but have to tweak the BCLCK, and in the process you need to disable some of the power saving features like SpeedStep and C states. I was able to hit 160MHz BCLCK with a 27X multiplier, yielding a decent 4.3GHz clock speed. There are drawbacks (like idle power, which is about 30W higher than most other Skylake/Kaby Lake CPUs), but it ends up being a very capable chip. It also ends up with the highest overclock, in terms of percent increase over stock—4.3GHz being nearly 40 percent higher than the 2.7-3.3GHz the chip runs at stock. For the X99 chips, there are more options available, like per-core overclocking on Broadwell-E parts. I decided not to try for the final 1-2 percent performance increase and just apply the same overclock to all cores. I know that in testing, the i7-6950X appears to have three cores that could go higher (they're typically 5-10C lower during stress testing than the other cores), but that will vary by chip. Finally, we have the three Kaby Lake processors. I had hoped to hit 5.0GHz on Kaby Lake, but I only managed that with the i7-7700K. Depending on yields, this could be the result of binning (the best chips become i7-7700K while lesser chips become i7-7700 or i5-7600K for example), or it could just be luck of the draw. The i3-7350K and i5-7600K both ended up at 4.9GHz, coming up just short of the hallowed 5GHz land of milk and honey. Interestingly, the i3-7350K with an inexpensive cooler (an old Intel boxed air cooler from a Haswell or Ivy Bridge chip, believe it or not) could still run fine at 4.8GHz, which is something to keep in mind. The higher power draw of quad-core parts will require something more, however. Intel has added a new feature with Kaby Lake that factors into overclocking—or rather, they brought over a feature from Broadwell-E and Xeon processors. AVX instructions can use more power and create some instability with overclocking, so Intel added an AVX offset multiplier. The values start at 0 and go down (negative), and when the CPU runs AVX instructions the multiplier will drop by the specified amount. In practice, this didn't matter on any of the CPUs I benchmarked...except for the i5-7600K, where I set AVX offset to -1 in order to successfully complete y-cruncher without throttling or other errors. Anandtech's overclocking testing offers a bit more detail on AVX offset, but they weren't able to surpass a 5.0GHz overclock, either. Careful, those pins are fragile! As with the main Kaby Lake overview, I have limited performance results when it comes to gaming. I've done a bit of testing with i7-5930K and confirmed that the increased CPU core counts on Haswell-E and Broadwell-E don't do much for gaming performance, so I'll only report gaming performance for the Kaby Lake and Skylake parts, while I'll show the full suite of CPUs for non-gaming tests. What's the best overclocking chip? If you're talking about the potential for improved performance, that's easy: it's the i5-6400, where performance increases an impressive 35 percent thanks to the 160MHz BCLK. Is it fair to include a non-K CPU in the charts? You can be the judge, but obviously it makes the value proposition for the i3-7350K very questionable. It also explains why Intel doesn't want to allow BCLCK overclocking on non-K processors, since it eats into the potential market for K-series chips. For the officially overclockable CPUs, the largest increase in performance is the i5-6600K, improving by nearly 20 percent. The i3-7350K comes next, with a 17 percent improvement. The i5-7600K performance is up 15 percent, followed by the i7-6700K at 11 percent, and finally the i7-7700K at just 8 percent. That's pretty much what you'd expect from the base clock speeds—the higher the stock clocks, the lower the potential improvement from overclocking. Looking at the individual performance charts, the three Kaby Lake chips all do great at single-threaded performance, since they have the highest clock speeds and are otherwise the same architecture as Skylake. In other words, if you never want to mess with overclocking, Kaby Lake's clock speed improvements are a nice little bump, but there's little new overhead for overclocking, so the year-old Skylake chips can make up for the speed difference. There are a few tests that clearly favor Intel's architecture over AMD's Bulldozer (y-cruncher for example), but AMD's chips are mostly here as a point of reference—Ryzen will be the real comparison come March. AMD does do pretty well in the VeraCrypt and 7-zip tests, though. I don't have current gaming results for all of the processors (yet). That allowed me to fit both the stock and OC numbers into a single chart, which gives a nice view of the full range of performance options. And what we learn isn't too surprising, though the i3-7350K results might raise a few eyebrows. Even at stock, the i3-7350K ends up just 15 percent slower than the fastest overclocked CPU for gaming—in overall performance, at least. Moving to the individual games, Hitman (DX12) is the best result, followed by Ashes of the Singularity. Both improve performance by 40-50 percent moving from stock i3-7350K to overclocked i7-7700K. Total War Warhammer and Civilization VI also show significant gains, at least compared to the i3-7350K. But if you're running any decent CPU, including the overclocked i5-6400, the benefits of moving up to a 'faster' processor are pretty limited. There are also plenty of games where your choice of CPU makes virtually no difference, even with a GTX 1080—look at The Division and The Witcher 3, for example, and Deus Ex, Doom (with Vulkan), Far Cry Primal, and Rise of the Tomb Raider aren't much better. Battlefield 1 single-player also doesn't need a ton of CPU, though the multiplayer game is a lot more demanding. Overall, unless you have a relatively slow CPU (like the stock i5-6400 or i3-7350K), overclocking isn't going to net you a lot of extra performance in games. That's not too surprising, since even in CPU limited situations we don't normally see overclocking help by more than 10-15 percent, but if you're wondering where the bottleneck lies in your gaming PC, look first to the graphics card, second to RAM and storage, and third to your CPU and platform would be my advice—unless you're running a very old/slow CPU. Kaby Lake is clearly better/faster than Skylake, but while it might be a statistically significant improvement, it's not generally going to be practically significant—especially for gaming. Overclocking doesn't really change the story, as the new chips generally get an extra 200-300MHz compared to Skylake, which in practice amounts to 3-4 percent more performance at best—and in games, not even that. It's great to see all three chips in the 4.9-5.0GHz range, even without a ton of effort. But will the added performance typically be noticeable? No. What about the new entry-level K-series chip, the i3-7350K? It's sort of a cool and novel idea, and it can certainly handle games. However, the price makes it a less attractive option. The i5-6400 with the right motherboard is one obvious alternative, and even if you're not doing non-K overclocking, I'd generally recommend looking at a Core i5 processor rather than the i3-7350K—the i5-6500 goes for $190 online, and runs about 10-12 percent faster (at stock) than the i5-6400 for example. The problem with the i3-7350K is that, in pursuit of saving $20 or so (relative to the i5-6500), you're getting a processor that needs a Z270 motherboard to shine, and in many tasks the additional cores of the i5 will still end up delivering a better overall experience. You could buy an i5-6500 or the new i5-7500, pair that with a less expensive H170/H270 motherboard, and run stock, all for less money than an overclocked i3-7350K plus Z270. In other words, where the Pentium G3258 was interesting primarily thanks to its ultra-budget price, the i3-7350K ends up being far too close to better CPUs to catch my interest. If you're not already running Skylake and were thinking about building a new system, short of waiting for AMD's Ryzen to come out (current ETA is March for retail availability), Kaby Lake gets you another 200-300MHz—stock and overclocked. Don't forget that the K-series CPUs also need a decent aftermarket heatsink, which can add another $30 to $100 depending on how high-end you want to go. Overclocking is easier now than it's ever been, but the potential gains have shrunk to the point where running stock doesn't mean you give up on a lot of 'free' performance.